This New Orleans French Quarter Walking Tour is a 3 in 1 multifaceted tour which includes the unique history of our amazing city and culture, reported haunting in the city and local recommendations and secrets! From the origins of the floods of the Mighty Mississippi River, depositing its silt and sediment to create the land we stand on today and to the depths of the swamps and the various cultural settlements that came in one by one, we take you on a journey through the fascinating stories of the Vieux Carre and the Garden District in the American Sector. See the architectural styles of the French, the Spanish and of course, the Americans, all while telling you how these came about as the people of New Orleans suffered though plagues, fires, hurricanes and war. Walk with a local to see it through our eyes! The tour will meet in the morning or early afternoon near the New Orleans Jazz Museum, where locals spend time socializing, and we will eventually make our way into the POP of the city! The journey begins with history of the settlements, from the Native Americans to the French, Africans, Spanish and eventually, the Americans. We walk in a residential section of town first and talk about the amazing architecture along the way, as well as important landmarks. 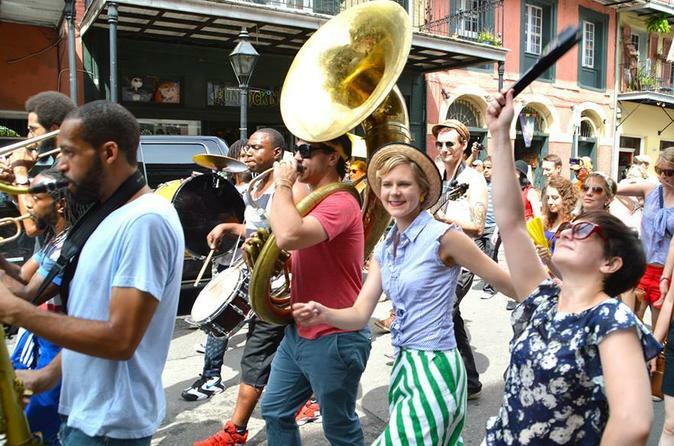 We will see Royal Street, where the art and antiques stores are, the street musicians and other performers, and walk into the Old Square and talk about the amazing history that started right here! See the beautiful Saint Louis Cathedral and the buildings that frame it, such as the Cabildo and the Presbytere. You will be dazzled by the brilliant colors of the beautiful architectural styles of the various cultures who settled here. Although time does not permit, we encourage you to walk into the Treme neighborhood, see where the African slaves gathered in Congo Square, celebrating their one and only day off every week, or the Native Americans dancing, the Voodoo rituals, the market and musical exchanges. Your guide will talk about and you will see the Mighty Mississippi River and talk of its origins, as well, the incredible "center of town", Jackson Square, where it all began with the French founder and the settlers in 1718. Upon finalizing your historic journey, your guide will be happy to recommend places to eat, drink and have fun as well as local insiders hangouts, celebrity information and other fun tidbits for your magical vacation to continue in the Vieux Carre.